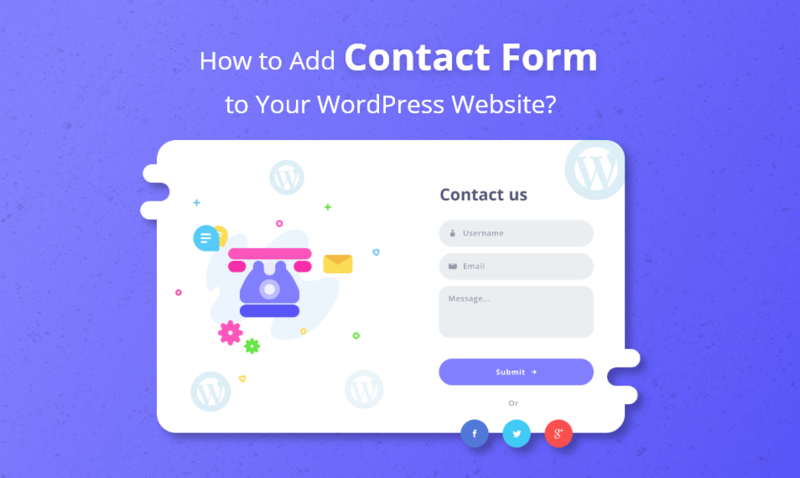 Home How to How to add Contact Form to your WordPress website? The process will start by installing the Contact Form 7 plugin. It is same as installing like any other plugin in the WordPress. To do so, you have to tap on the plugins option and choose to “Add New” option. After that, you have to type the name of the plugin in the box. After downloading the plugin, you have to activate the plugin so that it can be used. Once the installation process gets completed, there will be a new menu with the name of Contact in generated in your WordPress sidebar. Tapping on that option, you have to click Add New and it will take you to a screen showing below. Here, you have to fill up the fields about the name, message, or email address. The process is quite simple, and you feel difficulties in the starting and things will become better with practice. There will be a default form generated on the screen. Now, it is time for making some modifications like adding a drop-down menu, field type, name, and many other options. There is nothing complicated involved in the form configuration. Here, you need to understand the way tags work. Also, you are allowed to create the tags or make necessary changes. You will get used to this plugin after some time for sure. In this step, you have to configure the email that will send to you from the contact form. You can do this process by tapping under the mail tab located at the top. The fields will be pre-filled with similar tags through the contact form. You will also get the available field tags. Some additional settings will be empty by default. It ranges from limiting the people log in to submitting the form. They are not much important, but you can do if you want. Once you complete the configuration process, you need to live it on the site. Save the form, and a shortcode will appear on the screen. You need to place it wherever you want. Once you find the place, you have to publish it. That’s all, the process to add a contact form. You can see the process is very simple. If you have a question about How to add Contact Form, please write in the comment section.